In large pot of boiling salted water set over medium heat, cook quinoa until tender but still firm to bite, about 15 minutes. It's done when germ separates, making it look like a curly Q.
Quinoa, an ancient “grain” that’s actually an edible seed related to beets and spinach, makes a fantastic base for a salad. Its mild, nutty flavour lends itself well to soups, grainy breakfast cereals and anything in which you’d use rice or couscous. 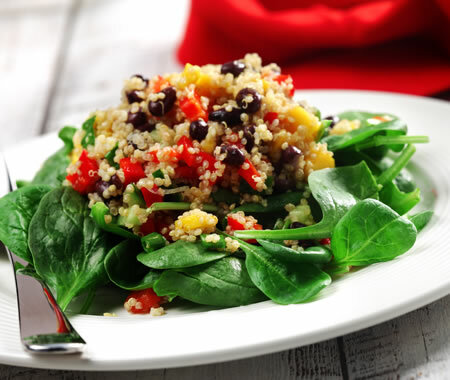 With a lighter, fluffier texture than most whole grains, quinoa is also a rich source of protein.